A suspended acoustical ceiling represents a significant percentage of a room’s surface. As such, these ceilings are critical to controlling the noise level in a space by providing a means of absorbing unwanted sound generated inside and blocking unwanted sound generated outside. Suspended acoustical ceilings are also important in controlling the growth of a fire by providing a barrier between the room and the space above the ceiling. The separation a suspended ceiling offers can delay a blaze starting in a room from reaching potentially combustible materials in the space above the ceiling. It can also slow the spread of flames across the surface of the ceiling material, therefore delaying the spread to other spaces. Most building codes rely on flame spread/smoke developed of the material ratings, and fire resistance of the assembly ratings to evaluate suspended ceilings, and roof/ceiling or floor/ceiling assemblies. These ratings are the result of testing based on CAN/ULC standards, with compliance determined by tests conducted at non-governmental, independent labs. It is important to note flame spread, smoke developed, and fire resistance ratings are separate issues and must be addressed independently in selection and specification. Flame spread classification (FSC) and smoke developed (SD) ratings are the result of testing according to CAN/ULC-S102, Test for Surface Burning Characteristics of Building Materials and Assemblies. FSC is the relative rate at which a flame will spread over the surface of a material. This index is compared against a value of ‘zero’ for inorganic reinforced cement board and of ‘100’ for red oak. It is the rate at which the flame actually spreads along the surface and not an indication of the fire resistance of the material. Acoustical ceiling panels that are part of a plenum require an FSC of ‘25’ or less and an SD of ‘50’ or less. These ratings pertain to the face, back, and any surface exposed by cutting or drilling through the panel. Plenum-rated panels are designed to limit the spread of flames and production of smoke across the ceiling panels into a space, rather than to contain or compartmentalize a fire. The fire resistance assembly rating indicates the degree, measured in minutes or hours, to which an entire floor/ceiling or roof/ceiling assembly can withstand fire exposure and high temperatures. Essentially, it defines an assembly’s ability to prevent the spread of fire between spaces and offer additional protection to the structure. 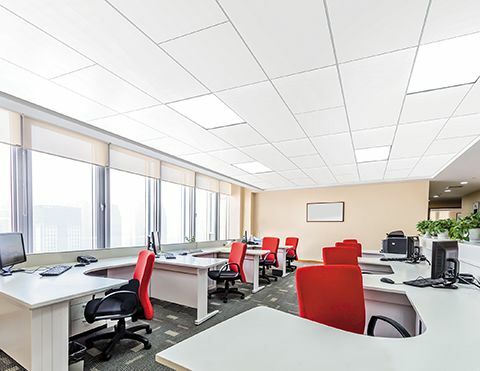 The primary purpose of acoustical ceilings in a fire-resistance-rated assembly is to limit the spread of fire across the ceiling panel either below or above the occupied space, and to limit the movement of heat and smoke through the panel or assembly. By doing so, they provide protection to the rest of the building elements comprising the fire-resistance-rated roof/ceiling or floor/ceiling assembly. 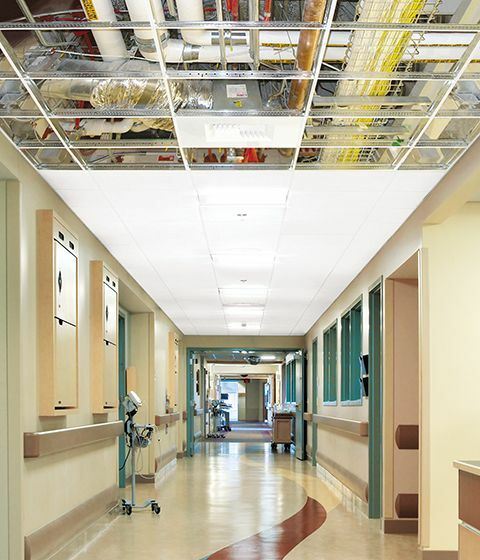 The space above ceilings in hospitals is generally not used as a return air plenum because of the numerous service lines running through it.